Informatics In Context’s (IIC) offers payers a transformative standards-based solution which fully automates their prior authorization (PA) process in real-time based on the ACA mandated EDI 278 standard for medical procedures, tests, labs, and drugs covered under medical benefits. IIC’s 278 Authorization Engine fully automates the payer’s PA process, as the vast majority of responses will not require human intervention. IIC is able to achieve a high level of touchless adjudication by automating all of the payer’s policies and guidelines, including all business and clinical rules required for real-time responses. Requests for documentation, attachments, and/or questions are handled electronically using the EDI 275 daughter transaction. 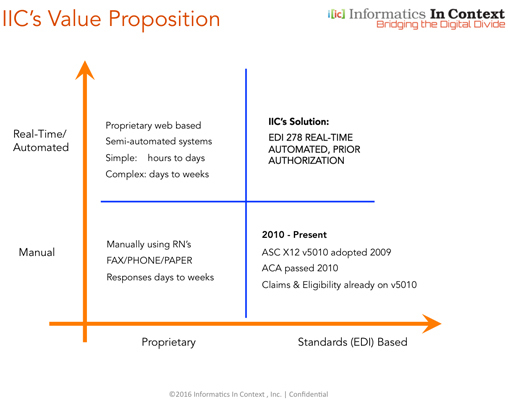 As described in the value proposition diagram, the ACS X12 V5010 standard enabled payers to process claims and eligibility transactions electronically in real-time. Today’s payer PA process is either manual or semi-automated if processed by 3rd parties, but in either case it’s a proprietary process, and not real-time. By realizing the full potential of the EDI 278 standard, a completely automated, real-time authorization process is now possible, one that can fundamentally transform utilization management itself. Using IIC’s cloud-based technology, payers can immediately approve submissions that meet their established payment policies and care criteria, with no need for further review, or pend those that require manual review. Automating the PA process using the EDI industry 278 standard enables payers to realize an order of magnitude in time and cost savings per transaction, provides instantaneous actionable responses to providers, and allows payers to expand PA review to the higher volume, lower cost procedures without provider objection. Automating the PA process in real-time enables payers to respond instantly to provider requests for prior authorization, based on the payer’s payment policies, business rules, and clinical care guidelines. A fully automated PA adjudication process is the only effective way to ensure that plan assets are protected from over-utilization, duplicative and-or unnecessary care, and fraud, waste and abuse. By automating the PA process based on the payer’s own policies and clinical guidelines, IIC’s solution delivers cost-savings and value for the plan, high quality care for the patients, and clinically appropriate service delivery by the plan’s participating providers. IIC’s provider portal or integrated web service is a single point of entry to all payers in the providers network to check eligibility (270), submit referrals and prior authorization requests in real-time (278) using single sign on, without needing to login into individual payer sites each time. IIC’s solution reduces PA submission time and cost per transaction by an order of magnitude, reduces administrative burden, eliminates unnecessary delays, and significantly lowers costs. It offers uniformity and standardization of workflow to all payers based on using the EDI 278 standard. Automating the PA process promotes high utilization while reducing or eliminating the manual process of paper, phone, and fax. IIC’s provider solution can be integrated as a RESTful web service into any system (e.g. EMR or practice management system) or used stand-alone.